Is that just to show how lazy McDouche is? Someone had asked previously in a post for O-Line stats. Take a look at Backus, he's a bit worse, but I'm sure the left side is a bit harder to defend. Someone said before that it's hard to judge sacks allowed on paper, and I agree. However, false start and holding penalties are HUGE. Especially on those 3rd and long situations when we get a nice run or a nice catch called back for something stupid. Sorry I don?t memorize game tapes but I do remember Backus had a couple awful games last year where he looked overwhelmed at times. I guess my definition of ?dependable? is different than yours to me ?dependable? is a player who plays at high level game in-game out and year in-year out like Jason Hanson. By your definition Raiola has been a ?dependable? center. Well if you look the sack total this past year it went up from 9 to 36. Was the line almost four times worse than the year before or did Harrington just hold onto the ball longer in hope a play would develop. If that wasn?t the case than signing Woody was mistake because the line was better the year before with Beverly and Brown. The line ran blocked better the second half of the season but there was still a number of times they passed the ball on 3rd and 3 or in the red zone because they knew they couldn?t run it. They also had trouble killing the clock when team put 8 men in the box to stop the run in the second half of games. To me that?s not controlling the line of scrimmage. All I?m saying is the Lions could afford to upgrade the line and Barron would be an upgrade so he?s a player to consider. As for not being sold on Backus he?s a free agent next year and I?m afraid the Lions are going to overpay him like they did Raiola. I never realized Backus gave up 8 sacks this year. but thats not bad. I would like to see us get Barron, he would be an upgrade . 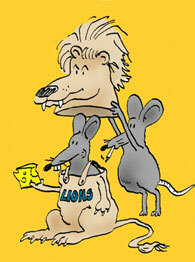 I aslo think the Lions will re sign Backus next year. The guy is a good player I really like Backus and the guy is there playing week in and week out and does a good job. The great thing is I think Millen has done a good job in upgardeing the line and we should be sucsseful next year. I am also guilty of being a lineman whore. That is the part of the game I like to watch. I'm up in 3 picks. My thoughts are Justin Tuck, Brodney Pool or Justin Miller. I think that Tuck could make the most immediate impact as a situational pass rusher. However, I think Pool is a better long term projected starter. Tough call my man. Tough call. I would imagine that New Orleans will make your decision a bit easier should they nab Tuck right in front of you..
Last edited by yostevo on April 1st, 2005, 12:13 pm, edited 1 time in total. I like Pool as well, but it seems the biggest buzz is for a OT and DE in the 1st two rounds. Both are somewhat steals as they projected to go in the 1st rounds in a lot of mocks. I think that Tuck could make the most immediate impact as a situational pass rusher. However, I think Pool is a better long term projected starter. Tough call my man. Tough call. I would imagine that New Orleans will make your decision a bit easier. NO went with a Thomas Davis so they could nab Tuck. I'm not sure how CHI is looking at safety, but I know their debating TE or RB at this point. Yeah, I noticied that about N.O. so I edited my original post. Poole would be a steal at this point but Tuck would be a nice consolation prize as well. Tough call between Tuck and Pool for me, but it came down to adding depth vs. upgrading a position.